Sometimes in life there is a person or animal that always brings a smile to your face when you cross paths with them. I have one cow here that always does that for me. Her name is Dixie and she is one very unique individual. When she was born a few years ago, she was a very small calf and totally black. From day one, she was always a very friendly, cute calf. As she grew, she stayed that way. It didn’t matter if Dixie was on the barnyard or out in the pasture, she would always want to come up to us and nose us and want to be petted. Dixie learned fast that besides getting petted there were also other benefits to being such a pet. One thing I would do every once in a while would be to slip her an apple. She really likes apples and will munch one down in a few seconds. Since we have several apple trees on our farm it’s easy to sneak her one quite often in the fall of the year. She thinks it’s absolutely wonderful when we do this for her. 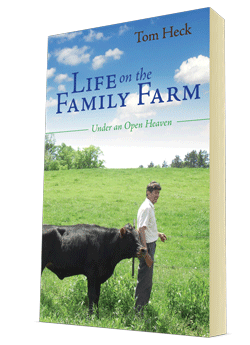 I had a problem arise here a couple years ago though, when we were publishing our book, the publisher wanted a nice picture of me on our farm for the cover of the book. Well, I thought right away that I should have one of my cows or heifers in the picture. It would have to be one that would pose well with me, and I wanted it out in the pasture in God’s beautiful country. I knew that it would have to be Dixie. The publisher told us that he wanted us to take a lot of pictures for him, because he’s really picky when it comes to choosing the right picture for a book cover. Now I had two problems, one was that Dixie would only cooperate naturally for a few pictures before she would just walk away. Now I knew if I had apples I could keep her there for a fair number of pictures, but it wasn’t apple season. So we talked it over as a family and decided we needed to find something else that Dixie would really like that would keep her attention for a lot of pictures. We tried a number of things and finally hit the jackpot with her: black licorice jelly beans! She absolutely loves them. The amazing thing is that I’ve given them to other cows, and they will take them into their mouths for a few seconds and then will always spit them out. But Dixie will never spit one out; she just wants more and more of them. As a result, we got about 100 pictures of the two of us for the publisher, which made him very happy. But now I have to keep buying black jelly beans for Dixie! Every day when I come into the barn she eyes me up with her big brown eyes and her ears perked all up to see if I remembered her favorite treat. And if I have one for her, her tongue will come way out to take it right out of my fingers. To get those black jelly beans is the highlight of her day. Dixie is one of the smallest cows in my barn, but a very special one. Sometimes a cow will surprise us, and she really surprised us here a couple weeks ago. She was due to give birth, we were expecting one calf, but Dixie decided she had to reward me for all those black jelly beans, and she gave us twin heifer calves! We were absolutely amazed. So afterwards, to let her know that she had done an exceptional job, I petted and rewarded her with four black jelly beans. Since Dixie is one of the smallest cows in my barn, she’s also one of the lower producing cows. But, she’s special and she does well for her size. So it is in God’s eyes, we are all very unique and special and greatly loved by Him, even if we’re not big name people. For those of us who know and follow God, He promises that surely goodness and mercy shall follow us all the days of our lives. And what’s more is that we will dwell in the house of the Lord forever!